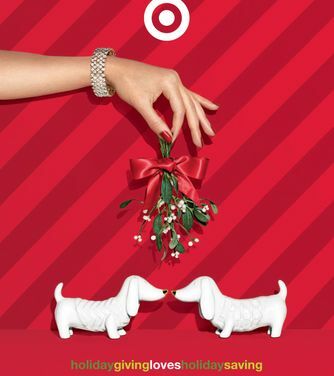 Target Corporation (NYSE: TGT) today announced new initiatives for the holiday season centered on irresistible products, unbeatable value and guest-friendly services – including new and enhanced digital tools and free shipping on all Target.com orders now through Dec. 20. With conversion on Target’s digital channels up 40 percent this year, guests are turning to Target.com for more of their shopping. To make it even easier for guests, for the first time, Target will offer free shipping on all Target.com orders for the holidays, now through Dec. 20. Additionally, more than 65,000 items are now available for Store Pickup on Target.com and 80 percent of orders are fulfilled within one hour, making it a convenient option for busy shoppers through Christmas Eve. Target will launch a Wish List app beginning Oct. 31— a modern and digital take on the classic tradition of creating holiday wish lists for parents and kids. Kids can add must-have items to their list, while parents can share the list with friends and family. Target’s Wish List app also offers an augmented reality feature that works with Target’s Kids’ Gifting catalog. Plus, guests can save 10 percent on their Wish List on one day of their choosing before Nov. 26. The app can be downloaded on Apple and Android mobile and tablet devices or printed on the registry kiosks in Target stores. Additionally, mobile and tablet apps are re-launching in time for the holidays. With these enhancements, guests will find it even easier to locate and purchase what they’re looking for using interactive store maps and shopping lists as well as streamlined checkout including, Apple pay in the iPhone app. Target has created more ways than ever for guests to get unbeatable value all season long, including weekly sales, weekend promotions and exclusive deals on Target.com and Cartwheel, Target’s industry-leading savings app. Cartwheel will offer daily deals for its more than 10 million users, and from Nov. 2 to Dec. 24, Cartwheel will offer 50 percent off a different toy every day. The app will have new features for the holidays, including special deals for top users, personalized recommendations and a select number of popular offers that do not expire. For the third year, Target is extending the timeframe of its Price Match Policy for the holiday season beyond the typical seven day window. If a guest purchases a qualifying item at Target between Nov. 1 and Dec. 24 and then finds it for less at Target.com, a local competitor’s printed ad or at select online retailers, Target will match that price. For more details, including terms and conditions, visit Target.com/morereasons. As always, REDcard holders get five percent off nearly all purchases, free shipping at Target.com, and an extra 30 days for returns. Since five percent REDcard Rewards rolled out in 2010, Target has saved guests more than $2 billion and will thank guests for their loyalty with perks throughout the holiday season. Top electronics gifts for all ages, including Beats by Dre, Apple iPhone, Skylanders Trap Team and exclusive iPhone cases designed by Brooklyn-based graphic designer and letterer, Dana Tanamachi. TOMS for Target, featuring more than 50 items including apparel and accessories, shoes and home goods all priced under $50. In addition to the five percent of its profit Target gives to communities every day, Target will donate blankets, meals or shoes to people in need for each TOMS item purchased. The collection will be available beginning Nov. 16 for a limited-time-only. Annie for Target by Renée Ehrlich Kalfus, a limited-edition collection of girls’ apparel and accessories inspired by the remake of this family-favorite movie, all under $30 and available beginning Nov. 16. A beautiful, limited-time-only collection of American-made scarves, throws and handbags from the 150-year-old Faribault Woolen Mills in Minnesota. Available beginning Nov. 2 exclusively through Target’s digital channels. Fitness and travel accessories in unique and retro prints, designed by London-based artist, Orla Kiely, available exclusively at Target. Exclusive Threshold and Nate Berkus at Target home décor and entertaining items. Cozy, stylish apparel and accessories for the whole family featuring key seasonal elements like cashmere blend, genuine leather and faux fur. Top Toys, including exclusive Disney Frozen My Size Dolls, Wubble Bubble Ball and Zoomer Dino - Boomer and Target’s Boutique Brand toys from brands such as Wonderology, Hape and Mindware. Exclusive beauty products at a great value, including luxe brushes and bags by Sonia Kashuk, new holiday gift sets from Pixi by Petra and an assortment of makeup palettes, fragrances and hair appliances. This holiday, Target will partner with innovative New York retailer STORY. STORY brings an editorial lens to retail and reinvents itself every four to eight weeks—from merchandise and store design, to floor plans and fixtures—bringing to light a new theme or trend. From Target’s design partnerships to its everyday collections, STORY will curate its favorite holiday treasures from Target, alongside its other must-have items for the season, beginning Nov. 5. Target's marketing campaign will encourage people of all ages to let loose, give into the spirit and feel the unmistakable joy of the holiday season. The advertising, which will start to run on Nov. 2, will boldly embrace the iconic elements that make Target, Target—using the red, white and Bullseye that guests love. The campaign will include broadcast, radio, out-of-home and catalogs with an increase in digital media support by 50 percent. Target stores will be transformed with fun and whimsical in-store décor created in partnership with David Stark Design, one of the top event design agencies in the world. Click for Spanish version of this release.